The Machax is one of his first designs and it was in the year 2008 that he collaborated with Ka-Bar, which gave him an opportunity to once again release the BK4 knife to the masses in response to its lasting popularity. The design of the Ka-Bar Becker BK4 draws its inspiration from kukri choppers, which is why it comes with a wicked recurve blade. In fact, the knife is said to be a hybrid of the kukri, light ax and bolo knives. The Machax blade is black in color and 9 3/8 inches in length. The Machax blade is made from 0.188″ thick 0170-6 steel (more commonly referred to as 1095 Cro-van, added chromium and vanadium) and comes with a black grivory Zytel handle that features a large lanyard hole for added security during hard use. The high quality 1095 Cro-van steel is highly durable, hard to chip, ideal for chopping and easy to sharpen. The grivory handle is made from a durable material Kabar uses in a majority of the knives they design and manufacture. The overall length of the knife is 14 11/16 inches and though the knife seems to be on the larger side (though a little small when measured against comparable kukri blades), it’s not hard or clumsy to use. For its protection and easy storage, the Ka-Bar Becker BK4 comes with a tough sheath in matching black polyester material. The sheath has a front accessory pocket which proves useful for storing small gear like fire starters and sharpening stones on your hunting trips. If you opt to there is also the option to buy its accompanying green canvas micarta handle, as the scales for the Machax handle are user replaceable. The full/extended tang blade construction of the knife has an HRC of 56-58 with a flat grind and distinctive shape. It is this design of the BK4 Machax that provides a high quality and durable knife that can easily take a beating, provide long lasting cutting power, give decent results for chopping and good enough edge retention so that you are not having to constantly resharpen and hone the blade to keep a usable edge. The recurve design of the blade helps distribute the weight of the knife forward to make it relatively light and effective chopper, meaning the BK4 is an ok replacement for a small ax or hatchet. Just “ok” though, as a full size kukri would definitely provide better results for task involving heaving chopping. But for light or occasional chopping it does a good enough job for a blade sporting a cutting edge under 10 inches in length. The BK4 Machax is ambidextrous in design and use, features blacked out hardware and comes with full MOLLE compatibility. These are popular traits often sought after in tactical knives by military and law enforcement personnel. The black blade coating is also very resilient and does a admirable job of resisting scratches and wear. The Ka-Bar Becker BK4 Machax is designed to facilitate easy preparation of firewood, helps with the improvisation of shelter in survival situations and can be used for clearing camp sites. The knife has a functional and utilitarian design with durable construction, high quality materials and a excellent mix of cutting/stabbing/chopping power. A very good general purpose blade that excels in a variety of jobs, though appears to be a master of none. 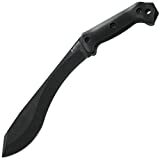 For pure chopping task a kukri would be probably suit you better and for precision cutting tasks there are many smaller survival knives that can best the Machax, but you would be hard pressed to find a medium to large sized machete with the versatility found here. The factory edge of the BK4 is decently sharp and rather easy to sharpen to achieve that extra fine, razor-like edge. This knife is tough, comfortable, powerful and though not too efficient as a full sized ax replacement, it is relatively light in weight and has its own positive attributes that lend it to medium chopping tasks that you may otherwise need at least a hatchet to accomplish. It’s a great draw knife to use for peeling bark and shaping wood. In fact, it is really great to use for carving, much better than other similar sized tools. Also great to use for making feather sticks and the angled blade with flat spine makes for easy batoning. At first glance, some users may be put off by the angled blade and overall shape if never having used similar styled knives or kukris, but once the initial unfamiliarity wears off and you become more accustomed to the knife and how it feels in hand the advantages become obvious. While the handle of the Machax feels rather nice and comfortable in hand, during hard use you may feel that the grip can slide around a bit. Not that it has bad grip, just the stock handle scales are somewhat on the smooth side and could do with some added texture for improved traction. This is where the replaceable handle scales come in handy as I suspect the optional micarta handles would provide a more sturdy and secure grip. It would also function well as a tactical knife, given the ambidextrous design and MOLLE compatibility. No major complaints about the sheath as it does the job perfectly fine and seems to hold up well under rough use. While the Ka-Bar Becker BK4 Machax may not be the most optimal choice for big chopping jobs or felling trees to build your own bugout cabin in the woods, it’s great for self-defense and typical tasks usually done while camping, such as building temporary shelters, skinning animals (if your careful not to puncture the hide), batoning, clearing overgrown brush, cleaving vines, debarking and processing wood for camp fires. While the Machax is of very high quality with a unique appearance, the factors deciding whether it will suit you depends on your individual needs and budget, as the BK4 Machax is not exactly cheap. As of writing this review it sells for around $80. This blade has served me well thus far. The only problem is deciding which of my Becker blades to carry. This one is probably best where woods survival is concerned, but one could also use the BK9 with similar results.